Joop! 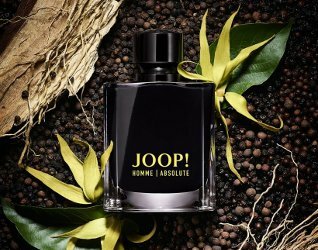 will launch Homme Absolute, a new flanker to 1989's Joop! Homme. Like the JOOP! Homme man, the JOOP! Homme Absolute man is a born seducer. He is confident enough to let his guard down. Never taking himself too seriously, he knows that humor and playfulness pave the way to happiness. But he also values closeness, complicity and intimacy. Because he believes in himself and pursues his own passions, he can shed his ego to share time, trust and complicity with the people he loves. JOOP! Homme Absolute is a fragrant illustration of men’s dual nature. Indeed it contrasts a very unexpected floral heart note with an unmistakably masculine base accord. The fragrance opens with a spicy note of black pepper. This energetic and catchy overture gives way to the mesmerizing scent Ylang-Ylang, which is more common note in feminine fragrances. On the other side of the spectrum, the top-down is a very powerful blend of virile notes: fresh and aromatic vetiver, rich and aromatic tonka beans and a hint of precious incense. Joop! Homme Absolute will be available in 80 and 120 ml Eau de Parfum. all kidding aside, I would not mind trying this one…I wore Joop! (Womens) and Joop! (mens) when they first came out and loved both. I have not smelled any version of Homme in years, but this does sound nice! I don’t even know what distribution Joop has in the US, just have not been paying attention. That makes two of us LOL! It used to be “Concentree.” Then it was Extreme or Intense (or EdP), and now it’s Absolute or Absolu. And there’s no way to know how similar it is to the original unless you try it, though reviews are sometimes helpful. And then you often find that it smells very similar to something else anyway! Perhaps if one wants a unique fragrance that’s wearable and doesn’t cost a fortune, “vintage” Avon is the way to go. LOL. This definitely sounds worth a sniff to me. It sounds like a commercial for ED. I’m in trouble if vetiver. tonka bean and incense = virile! The Joop! man sounds like a catch. Is he tall, dark and handsome as well? Hahah. Sorry couldnt help it after reading the ad copy. But if I recall the brand went bankrupt and changed owners….